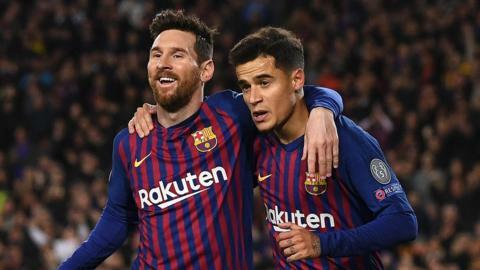 Lionel Messi scores twice as Barcelona reach the Champions League quarter-finals for a record 12th consecutive year with a win over Lyon. Wasteful Barcelona cannot convert any of their 25 shots in a goalless Champions League last-16 first-leg draw against Lyon. Leaders Paris St-Germain suffer their first Ligue 1 defeat of the season as Nabil Fekir's second-half penalty earns Lyon victory. Liverpool are drawn against German giants Bayern Munich in the Champions League last 16, while Manchester United face Paris St-Germain. Manchester United manager Jose Mourinho says Memphis Depay is a "fantastic professional" who has the talent to be brought back to the club.